Back in November, Orkut announced that orkut was open to developers. Developers have been building exciting new social applications over the last few months that will make the orkut experience even better. This is why we’re excited to announce that apps will be available to a subset of orkut users starting in a couple weeks, and to all orkut users several weeks after that. In the meantime, here on the orkut blog, we will be inviting guest posts from developers as a sneak peak into some of the apps developers have built, so stay tuned! If you’re a developer and want to have your app available to orkuteers the last week of February, you can find out more on how to submit your app here. If you need more info on how to build an app, check out http://code.google.com/apis/orkut/. The latest versions of APIs are available, and developers can build and test their apps at sandbox.orkut.com. We are going to be accepting applications into the directory manually in order to ensure apps are high quality. To get the latest news on the orkut sandbox, check out the new orkut developer blog. Have an orkut app that you would like featured here? After you’ve submitted your app to us , send us an email (orkut-app-submissions@google.com) with a description (250 words or less), screenshots, and/or a video walkthrough. And the actual M at the end of the video? That’s 3 sweaters, 3 balls, 3 pillows, 2 dumbbells, 2 pair of gloves, a set of child’s plates, a hockey stick, a scarf, a paper folder, hats and slippers. All in red of course. Sometimes you need to chat with someone about an urgent project, but can’t be bothered by anyone else. And going “busy” just isn’t enough — you might still get that unwanted ping. So, as some people have already noticed, we rolled out invisible mode for the latest version of Gmail chat last Friday. With this feature, you can appear offline, and still send and receive messages. 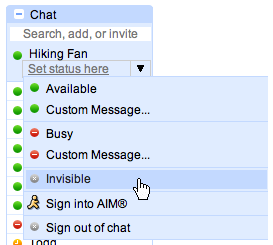 If you’re using AIM in Gmail, invisible mode also makes you appear signed out on the AIM network. Invisible mode is one of the most requested chat features and so we’re happy to add this option, starting in Gmail Chat, and in the future all Talk clients. As some of you have already noted, chat could be less useful if lots of people go invisible. We’ll keep an eye on it and look for your feedback to be sure we’re doing what’s best for the community. A group of 4 to 8 year-old Children were asked, “What does love mean?” The answers they gave were broader and deeper than anyone could have imagined. EACHER : Goss, why do you always get so dirty? TEACHER : Winnie, name one important thing we have today that we didn’t have ten years ago. TEACHER : Clyde, your composition on “My Dog” is exactly the same as your brother’s. Did you copy his? “You may visit this store ONLY ONCE!” There are 6 floors and the value of the products increase as you ascend the flights. You may choose any item from a particular floor, or may choose to go up to the next floor, but you CANNOT go back down except to exit the building! So, a woman goes to the Husband Store to find a husband. Floor 3 – These men Have Jobs, Love Kids and are extremely good looking.”Wow,” she thinks, but feels compelled to keep going. To avoid gender bias charges, the store’s owner opens a New Wives store just across the street. The 2nd floor has wives that looks & cooks good and have money. A little trivia information . . .